Simulate with mass action, Gillespie Next-Reaction and lattice-based particle diffusion and reaction algorithms simultaneously. Three-dimensional diffusion and reaction in a cubic volume. Two-dimensional diffusion and clustering reaction on a planar surface. One-dimensional random walk on a filament. Particle tracking with fluorescent tags. Individual particle tracking across different states with fluorescent tagging. Create beautifully rendered simulation movies with Blender. Modeling, simulation and logging are Python scriptable, but simulation speed is uncompromised thanks to Spatiocyte's C++ core algorithm modules. Spatiocyte software and documentation are publicly hosted on GitHub. Contact us if you have any issues with Spatiocyte. Molecules can diffuse and react in filament (1D), membrane (2D) and cytosolic (3D) compartments. The effects of intracellular molecular crowding can be studied since each diffusing molecule has spatial dimensions. Run multi-algorithm simulation with Gillespie next-reaction, mass-action and lattice-based particle reaction-diffusion methods simultaneously. Build and run models, log and plot data in Python. Simulation speed, however, is uncompromised thanks to C++ core algorithm modules. Enter your password when requested since some packages require the administrator privilege to install. If you have any issues during install, post the error messages to the Spatiocyte Users forum. On Mac, the installation script will take a longer time to finish executing because more packages need to be downloaded. 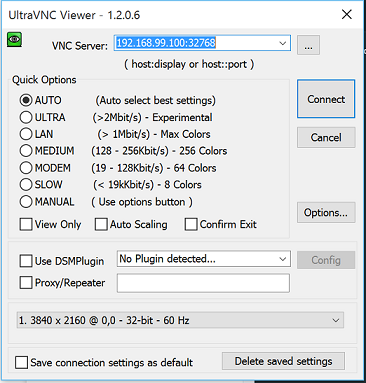 We can use Blender to render simulation snapshots and VLC to view movies of the snapshots. Since the installation script does not install them on Mac, you can download and install them yourself from http://www.blender.org/ and http://www.videolan.org/ . Install the latest release of Docker toolbox for Windows and UltraVNC. If you are using Windows 10 Pro or Enterprise 64-bit, then you can install Docker for Windows and Kitematic instead of Docker toolbox for Windows. Kitematic can be downloaded from Dashboard menu after installing Docker for Windows. Run Kitematic from your desktop or start menu. Search Spatiocyte and create container for ecell/spatiocyte. Clic EXEC button and go into the Spatiocyte container. Issue the following command in the Spatiocyte container. 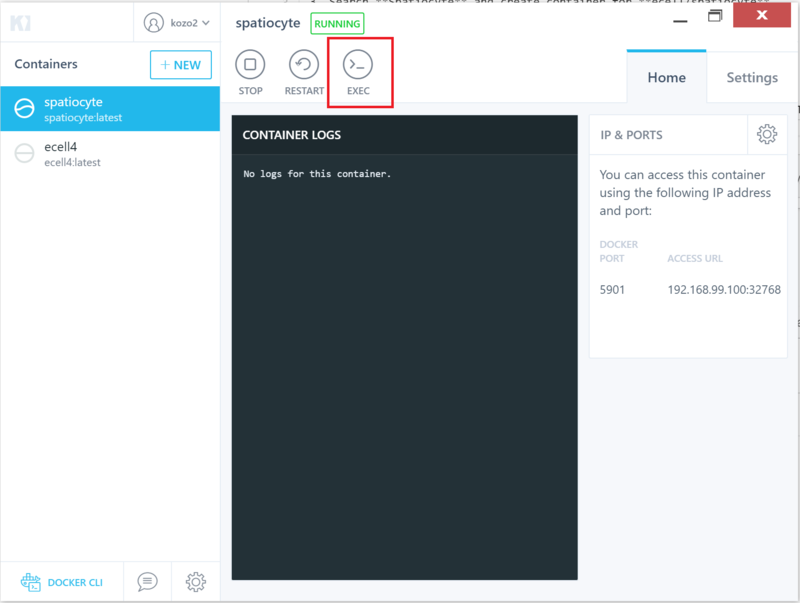 Connect Docker container ACCESS URL written in Kitematic IP & PORTS panel with UltraVNC. The password for this VNC login is password. 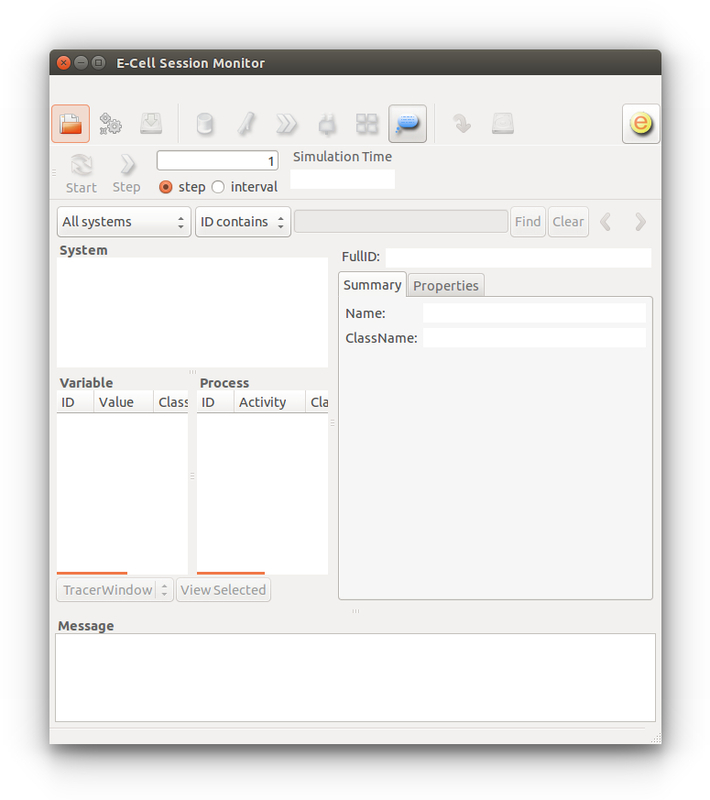 The above command will open the E-Cell Session Monitor, as shown below. You have now sucessfully installed Spatiocyte! If for some reason, the Session Monitor does not come up, please post the error message to the Spatiocyte Users forum. More models can be found under the examples directory . To run them, follow the instructions in the README file in the directory. If you have any issues or questions about Spatiocyte, message us. Spatiocyte documentation can be found here . To build a simple 3D model, open a text editor and add the Python scripts as provided in the code boxes below. Each Spatiocyte model requires the SpatiocyteStepper. It advances the simulation in an event-driven manner. The radius of the hexagonal close-packed lattice voxels can be set in the SpatiocyteStepper using the VoxelRadius property. In the code below, we have set the radius to 4.4 nm. The memory usage increases linearly with the number of voxels. In a 64-bit system, each voxel typically takes up 108 bytes of memory. The number of voxels with radius, r in a volume, V is given by V/(4r 3 2 0.5 ). In each compartment, the StepperID must be set to the SpatiocyteStepper ID. Here we only have the root compartment, rootSystem and we set its StepperID to 'SS' which is the SpatiocyteStepper ID given in the first line. We will use a cuboid compartment geometry for this model. The GEOMETRY variable of a volume compartment specifies one of the six supported geometric primitives: cuboid (‘0’), ellipsoid (‘1’), cylinder (‘2’), rod (‘3’), pyramid (‘4’) and erythrocyte (‘5’). More complex forms can be constructed using a combination of these primitives. Compartments without the GEOMETRY definition is set to the cuboid form since the default value is ‘0’. The three variables LENGTH[X, Y, Z] can specify the compartment lengths in the directions of [x, y, z]-axes, respectively. In the example above, the lengths are set to 250 nm. More information about the LENGTH variable definition can be found in the documentation . We must populate the molecules of A and B species in the compartment before the simulation is started because they initially have non-zero numbers. We populate them using the MoleculePopulateProcess. Next, we specify the reaction A + B -> C + C using the DiffusionInfluencedReaction process. We set the reaction probability, p to unity, which means a C molecule will be created whenever an A and a B molecule collide. We can use the VisualizationLogProcess to log the coordinates of the diffusing species at specified intervals or at the shortest stepper intervals (default). The coordinates will be saved in the file VisualLog.dat in binary format. The Spatiocyte Visualizer can load the log file to display the molecules in 3D while the simulation is running or after it has ended. Finally, we need to tell the simulator how long the model should be run. Here, we will run it for 0.08 s.
The above instruction will start the Spatiocyte visualizer, which will load the VisualLog.dat file and display the molecule positions in 3D. The short cut keys to manipulate the visualizer are provided here. The complete model file can be downloaded here. Chew, W.-X., Kaizu, K., Watabe, M., Muniandy, S. V., Takahashi, K. & Arjunan, S. N. V. (2019). Surface reaction-diffusion kinetics on lattice at the microscopic scale. Physical Review E, In press. Chew, W.-X., Kaizu, K., Watabe, M., Muniandy, S. V., Takahashi, K. & Arjunan, S. N. V. (2018). Reaction-diffusion kinetics on lattice at the microscopic scale. Physical Review E, 98: 032418. Shimo, H., Arjunan, S.N.V., Machiyama, H., Nishino, T., Suematsu, M., Fujita, H., Tomita, M. & Takahashi, K. (2015). Particle Simulation of Oxidation Induced Band 3 Clustering in Human Erythrocytes. PLoS Computational Biology, 11(6): e1004210.